In April 1851, Alfred C. Hobbs boarded the steamship Washington bound for Southampton, England. His official duty was to sell the New York City-based company Day and Newell’s newest product – the parautopic lock – at a trade show – London’s Great Exhibition. But Hobbs had something a bit more nefarious up his sleeve, or rather in the small trunk that accompanied him on the ship. 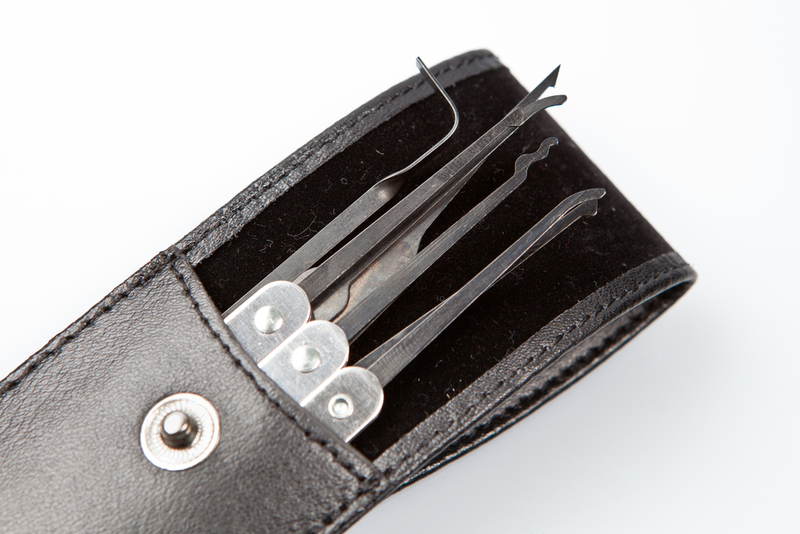 In it sat a large assortment of picks, wrenches, rakes, and other slender tools. You see, Hobbs wasn’t just trying to sell his locks. He was trying to prove that his competitors’ locks were, quite simply, not good enough. He had the tools, skills, and charisma to do just that. Alfred Hobbs was about to launch the Great Lock Controversy of 1851. By 1851, Chubb & Son and their “Detector” lock was so highly respected that they were given the assignment of creating a special security display cage that housed the great Koh-i-Noor diamond, a 186 carat diamond that currently sits in the Crown of Queen Elizabeth which is locked in the Tower of London. Numerous picklocks in London had made attempts at getting past the Detector with no success. In one instance, a picklock who had been imprisoned was offered his freedom if he could figure out a way to pick the Detector lock. He couldn’t do it. What made the Detector so difficult was that the lock had a built in anti-lock picking mechanism which, if triggered, would render the lock inoperable, even if you had the key. This trap worked such that if you lifted one of the pins beyond what the key would have done, it triggered the lockdown mechanism. By this, you could also tell if someone had tried to pick the lock, if your key suddenly stopped working. To get the lock to work again, a special regulating key was needed, which would reset the lock such that it could be opened once again with the normal key. The “Detector” was thought to be in a lock class all to itself. That is, until Hobbs got to it. At approximately 11:35 am, in front of the iron door in Westminster, Hobbs met his skeptical onlookers. He took out from his “waistcoat two or three small and simple-looking tools – a description of which, for obvious reasons, we fear to give” and went to work. 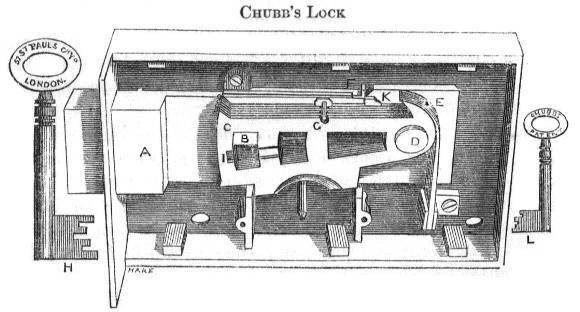 Within twenty five minutes, he had the lock open with a “sharp click.” He had once again successfully picked a supposedly impenetrable Chubb lock. Witnesses, hardly believing their eyes, asked him to do it again. So, he relocked the lock and picked it again. This time in seven minutes and “without the slightest injury to the lock or door.” England’s illusion of the security of their possessions had been shattered. After making his presence quite known at London’s Great Exhibition, Hobbs continued his lock picking tour in England. For instance, later that summer, he picked the “monster” Bramah Precision lock, which had never been picked since it was manufactured in 1790. This scared the Bank of England enough that they had all of their locks swapped out for Day & Newell’s. So how did Hobbs acquire his prodigious lock picking skills? Hobbs father died when Hobbs was just three years old, so as soon as he could work, he did so to help support his family. Thus, at the age of ten, he began his professional career as a farmhand. He eventually moved to wood carving, carriage building, tinsmithing, and harness making. Around 1835, he earned an apprenticeship with the Sandwich Glass Company (now a museum sixty miles outside of Boston) where he learned to make doorknobs and the locks that went with them; he soon also became very talented at picking those locks. He took those skills to Day & Newell and quickly became a very good salesman. After all, what’s a better way to sell locks than to easily pick your competitors’ locks in front of your potential customers? Before showcasing this talents to Britain in 1851, Hobbs picked his way across America. He hopped from town to town calling on banks to challenge him to open their safes, all in the name of selling Day & Newell locks, of course, and sometimes for prize money. For instance, according to a story recounted in A History of the Old Town of Stratford and the City of Bridgeport, Connecticut written in 1888, while on a job in Lancaster, PA replacing locks at a bank in 1848, a cashier showed him a newspaper ad placed by a “Mr. Woodbridge, of Perth Amboy” offering $500 (about $11,000 today) to the person who could open the lock on the safe in the New York’s Merchant Exchange reading room (now the National City Bank Building at 55 Wall Street) within thirty days. Hobbs proclaimed to the clerk, “That is my money” and left for New York right after finishing the job in Lancaster. 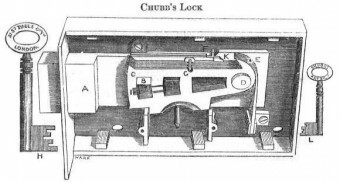 Hobbs met his challenger in New York and after parameters were set: three arbitrators were to oversee; he must use instruments of his own; and if he was not able to open the lock, Hobbs would have to sign a certificate declaring the lock perfectly safe and recommend it to the public. Woodbridge’s lock was extremely cleverly designed. Besides having 479,001,600 possible arrangements of the pins, it was “rigged” such that if the bolt was pulled before the tumblers were perfectly set, anything in the lock would be seized and you’d be unable to remove it, thus making the lock impossible to pick at this point with tool(s) stuck inside it. So the picklock couldn’t try to open the lock until he or she knew the tumblers were set just so. After everyone went home for the day, Hobbs was given access to the safe and began work on the lock at nine pm. In just two and a half hours, he had figured out the correct setting for the pins, and laced a thin metal wire into the lock to pull the bolt. Of course, he needed the arbitrators to witness what he’d done to get credit, so he waited until the following morning when they could be called upon. “There is something the matter with the lock,” said Mr. Hobbs. “What is it?” said Mr. Woodbridge. Carrying around an extensive set of lock picks during his trip to England wasn’t exactly a recipe for smooth relations with the bobbies who didn’t know who he was. As such, along with his box of lock picking tools, Hobbs also carried with him a letter from the Chief of Police of New York City, George Matsell, vouching for Hobbs’ character. 1851 was a rather vulnerable time for English citizens. It was the first time that England’s urban population outnumbered the rural population, meaning more people gathered in small spaces which made security more of an issue. Additionally, the Great Exhibition had brought citizens from across the world, foreigners, to London and to the untrusting eyes of its citizens. Plus, a rising middle class valued their possessions and property immensely and wanted to guard it. All of this rendered Alfred Hobbs and his lock picking skills both a point of fear and admiration. Chubb’s locks, despite its humiliation, continued as Britain’s industry standard. In fact, Chubb still operates today making safes that are “trusted the world over.” Alfred Hobbs stayed in London for nine years and began his own lock manufacturing company, Hobbs Hart Company. He eventually returned to the US in 1860, but the company stayed in London, on 76 Cheapside Ave., bearing its famous name. It remained there for another ninety plus years, until 1954, when it was bought, by the Chubbs Company. Hobbs, upon returning to the United States, didn’t go back into locks. He worked at the Howe Sewing Machine Company, helping Elise Howe engineer and design the lock-stitch sewing machine. Eventually, he joined the Remington Arms Company at the request of the company’s founder Marcellus Hartley, who was looking for a “mechanical genius.” Hobbs proved to be just that, filing a dozen patents for the company in firearm ammunition manufacturing. A Treatise on fire and thief-proof depositories and locks and keys By George Price (of Wolverhampton. WHAT A GREAT ARTICLE. THOUGH GAVE ME TONS OF INFERIORITY COMPLEX. This is a great article for sure, but not aptly named? What is the controversy? Lockpicking is quite a hobby today as I’ve discovered. There are sizeable clubs, a national organization and competitions for it. I joined the gym on the campus where I work and I hear about theft from lockers from time to time. I wanted to find as secure of a lock as I could and discovered this buzzing subculture, with demos on YouTube. I did discover one lock that has yet to be picked, made by a Finnish company called Abloy, the Protec2 line are the latest, with a long series of discs that have to be aligned, using a key whose angles and notches are cut in a three dimensional fashion. I wonder how Mr. Hobbs would have fared with one of them?